One of the ways the alienator tried desperately to control us was through something as simple as the kids’ teeth. She’d set the stage perfectly for all of them to have difficulty with their teeth many years before now. As ridiculous as it sounds, when they were very little, the alienator found a dentist who agreed to pull out the kids’ baby teeth. That’s right. Instead of letting the teeth fall out like normal children, the alienator had a dentist remove them. And just as you can possibly imagine, this set the stage for the kids to have dental problems. It also set the stage for the alienator to try and control us. Or so she thought. The never-ending letters and fight over making us pay for braces. Mariam’s teeth were by far the worst. Her teeth grew sideways, on top of one another and at one point she looked like a shark with rows of teeth that made no sense. And teeth were one of the things she felt she could control us with. 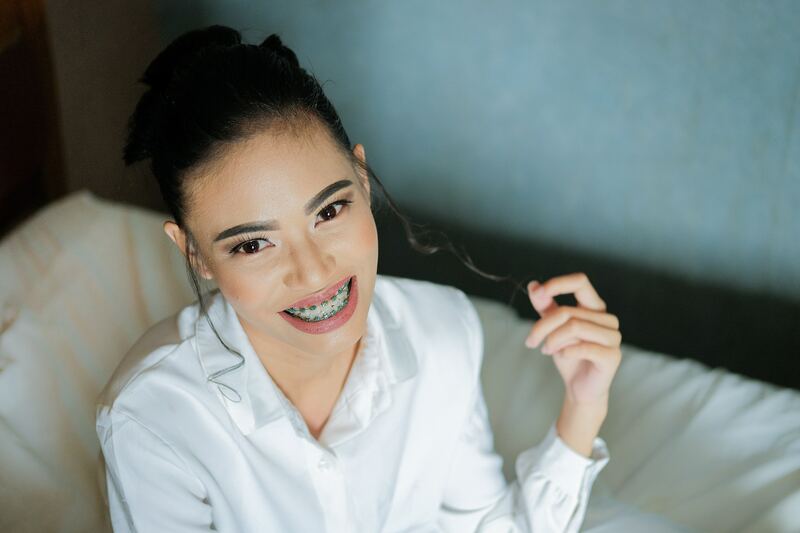 This never-ending battle for the braces went on for many, many months. She constantly tried to insinuate the GAL was urging her to schedule Mariam’s orthodontist appointment which was a total lie. These conversations are between Jack and the alienator through Talking Parents. … the childrens lawyer would like me to schedule mary an orthodontic appt to get an estimation for braces. You are also welcome to call and make this appt, and I can meet you there. Wednesday or Thursday work best for me. We like dr sharp in branson. I know she still has two baby teeth that probably will need to come out first. I believe they may be loose. I don’t have dr sharps number he is out of springfield. The alienator isn’t getting the response she wanted from Jack, so she continues. what day for may and dr. sharp for braces? what day for the orthodontist? The GAL requested that I make apt for orthodontist so that I could get estimation for her to have braces put on. I thought you would like to be involved with apt time. When mary has dentist apt you can also verify that mariam will need braces. Do you like Dr, Sharp for the orthodontist ? I will go ahead Monday the 18th of January and call Dr. Sharp’s office schedule apt if you give me your black out days. Mariams apt with Dr.Sharp is February 17th at 400 the Branson Office on hwy 248 to evaluate her for braces. I just called Dr. Sharp’s office. They said the “ballpark” minimum we’d be looking at for braces is $6400. They do not take Medicaid. I do not have $3200 for braces because of recent court costs incurred during the contempt case. As I stated the other day, braces are not a need but a want. Cheryl and I will let you know when we can afford them. dr sharp march 2 at 1:45 for consultation for braces. Mary’s dental issues are negatively affecting her view of herself and are interfering in her social and educational interactions. For example, Mariams irregular and extra teeth make playing her trumpet very uncomfortable. Mariam cannot eat fresh fruit without cutting it first, especially apples. One of her left lateral teeth is behind the rest of the row, making her teeth not meet properly. Mariam also has a tooth on the top row of teeth that is growing up and to the inside of the roof of her mouth, nearly touching the roof. Mary is so embarrassed about her looks that she refuses to smile in public. You can imagine that someone who is afraid to smile is learning odd social coping mechanisms. The alienator respectfully asks Mr. Mefferd to help her pay for Mariam’s orthodontic work. If Mr. Mefferd does not think that this is a necessary procedure, then please ask him to allow Ms. Alienator arranging these services on her own. We asked specifically what “odd coping social mechanisms” were but we never received an answer. The same day we received this letter, I checked the alienator’s Facebook page. Very seldom did the alienator post anything, especially when it came to the kids. But this day was different. This day she was making a point and giving us the middle finger. The girl that “refuses to smile in public” is smiling in public for the camera and has her picture posted on her mother’s Facebook page. During the time the alienator was pressuring us to pay for braces, I’d gotten Mariam on a waiting list through a program called “Smiles Change Lives.” This program, if accepted, provided braces at a very discounted rate. We were on the waiting list for over a year however on July 19, 2016, Mariam received her braces through the program! Ironically, when it came time for the alienator to cough up $315 for her half of the braces and application fee, she had many excuses. These are messages from the alienator through Talking Parents after Mariam received her braces for $630. I will leave all judgments to the judge regarding money exchange for braces…I am glad mariam has her braces on. I will work it into my budget for their needs. I have done my budget and I just cannot afford braces at this time I will be sure and let you know when I can afford to help pay for braces. To date, the alienator has never paid us $315 for her half of the braces she was so desperate to get onto Mariam’s teeth. Cheryl Mefferd is the founder of Parental Alienation Speaks, a nonprofit organization committed to bringing awareness to the world and hope to the parentally alienated. She is also a contributing writer for Stepparent Magazine and Medium.